About 13 percent of double-lung transplants in the U.S. came from donors who were heavy smokers, a new study finds. “I think people are grateful just to have a shot at getting lungs,” said Dr. Sharven Taghavi, a cardiovascular surgical resident at Temple University Hospital in Philadelphia, who led the new study. Surprisingly, however, organ recipients who do get smokers’ lungs often learn about it only afterward -- if at all, experts say. About 13 percent of double-lung transplants in the U.S. came from donors with a heavy smoking history, according to Taghavi’s new study, presented Tuesday at the annual meeting of the Society of Thoracic Surgeons. He and his colleagues analyzed records of some 5,900 adult procedures in the database maintained by the United Network for Organ Sharing, or UNOS, which manages transplants in the U.S. Typically, that meant smoking at least a pack of cigarettes a day for more than 20 years, or two packs a day for 10 years. In the end, after all other variables were accounted for, people who got lungs from heavy smokers lived as long and as well as those who got lungs from the tobacco-free, Taghavi found. There was no significant difference in cancers, though the study didn’t specifically look at lung cancer. 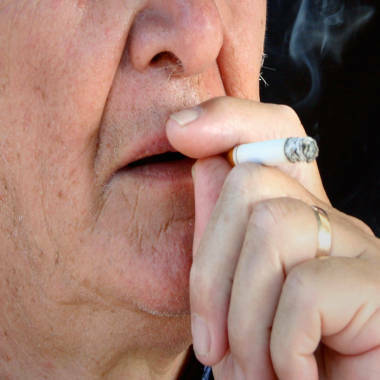 Only about 20 percent of smokers actually develop the worst effects of smoking, noted Hachem. “It is certainly counterintuitive to say we’re going to use lungs from a donor with a smoking history, but the majority of people who smoke do not have lung disease,” said Hachem, who was not involved in the study. Some people may have smoked for a long time years ago, then stopped, vastly improving the health of the organs. Others could have been active smokers when they died. The data in the study didn’t include that history, Taghavi said. Freeing up smokers’ lungs could help reduce a shortage that has left more than 1,650 people on the transplant waiting list -- the “last resort” for those with end-stage lung disease, according to the National Heart Lung and Blood Institute. There were nearly 5,200 liver transplants in the U.S. in 2012, but typically only half the people on the list receive lung transplants in a given year, the NHLBI said. Taghavi emphasized that transplant recipients who get lungs from heavy smokers ought to be told in advance. But Hachem said current practice usually doesn’t include that discussion. Recipients decide in advance whether to take organs from high-risk donors, including those with a history of infections such as viral hepatitis or HIV. But behavior habits, such as smoking, are almost never disclosed, Hachem said. “I don’t know what other centers do, but at our center, we don’t get into those details,” he said. Instead, the organs are inspected carefully and only those found free of disease or disability are approved for transplant. “We’ve sort of screened the organ pretty well,” he said. Of course, problems can occur. Widespread media reports last year centered on Jennifer Wederell, a 27-year-old British woman with cystic fibrosis who died of lung cancer last year after receiving lungs from a heavy smoker. In 2007, the family of a New Jersey man, Tony Grier, sued the University of Pennsylvania Health System after they said Grier developed lung cancer a month after a 2005 lung transplant. Court records show the case was settled in 2010. Such cases are very sad -- but also very rare, said Hachem, who noted that all transplants carry inherent risks. And, he said, most transplant recipients are like Randy Cooke, 52, of Chatham, Ill., who received a new set of lungs in 2011. Cooke, who was diagnosed in 2008 with a degenerative lung disease, said that by the time he was placed on the transplant waiting list, he would have accepted lungs from a heavy smoker -- gladly. “If I’d have waited another three months, I don’t know if I’d be here talking to you,” he said. If his lungs had come from a smoker, Cooke trusted that his doctors would have screened out any potential problems.